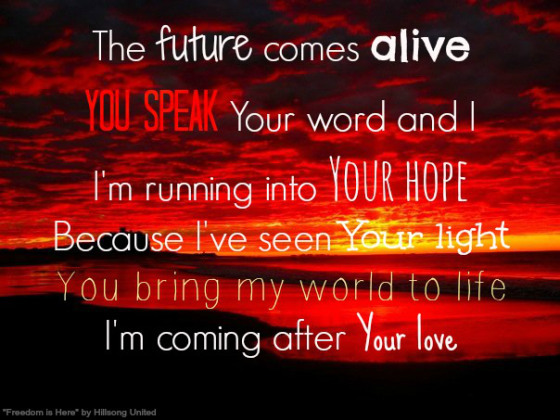 These are the lyrics to the first verse of the song “Freedom is Here” by Hillsong. I was reminded of them today as I sat in the Writing Seminar with Janice Rogers. When we began the seminar we had to introduce ourselves. Who are you? Where are you from? How do you see yourself as a writer? What kind of writing would you like to learn? What is a surprising bit of information about you? Unfortunately, I had to go first. I fumbled through these questions, not really having enough time to think about any past the first two. The first two are basically facts, while the others are more opinions or thoughts. I had a really hard time answering these questions. I’ve always loved writing. I would have rather written five essays than have taken one exam. I blogged like a maniac in my early days in college, and I have journaled since I can remember. I’ve written articles and devotionals, and obviously in university, I had to write papers and bible studies and commentaries (on 3 John…I mean really?!) Writing has always been there, but just like I discussed in this post, I feel there’s something new now. There’s something different in this season. It’s a different wave, just like teaching. Honestly, I think they kind of go hand-in-hand. So here it is – here is my dream. My dream that I am feeling encouraged to dream. The dream that makes me feel like singing “the future comes alive.” My dream is to have a consistent blog readership that I can inspire. It would develop into books, which would together create opportunities to teach and speak more. I want to inspire. I want to provoke. I want to encourage. I want to disciple. That is my dream. It’s been my dream for so long, but the biggness of it – writing books, plural – I’ve never allowed myself to speak it out. Why? Fear. Pride. A host of those great emotions and issues that we all deal with in varying degrees at some point or another. Forget those, though. I am inspired. God has spoken so much over the past 12 years that I have known Him, and through it all, I have come to this conclusion: I am not living an ordinary life. With Him, it’s anything but ordinary. I am good with that. Let’s see how it all unfolds!